I was wondering if anyone has retrofitted LED type MR16 bulbs into Motolight assemblies. Looks like a straight swap - if so, what were the results? Anyone have a lead on the brightest possible LEDs that will fit into the housing? Look for the lights that are 2 or 3 watt and have metal cases on the bulbs. The glass LED bulbs will fracture very quickly with vibration. Also the metal construction seems to dissipate heat better. Unknown why exactly, but I put a set of them on Jessica's Trike in the Kuryakin driving light assy (that are the same shape as motolights) with no problems for the last 8-9 months. Still going strong. Can't remember the vendor at the moment- I'll look back in my records and see if I can come up with info that way. I put a set of these in last year. Used a new set of gaskets as well. They have a warm and daylight (6000K). Daylight is a bit on the blue side. They are nearly as bright as the Motolights but are only 4 watts. Straight on they are very bright but the beam spread drops off quickly. I believe the Motolights are eight degrees. The Environmental Lights are ten degrees. There are different beam spread diffusers available. Light Bulbs Etc. has a 5 watt unit. SuperBright LEDs has some 6 watt units. OK, good options here. The issue is my friend's 2005 F650CS has a set of Motolights on, with the 50W per side MR16s. After about 20 minutes on, unless on highway, the ABS lights will come on, and within 5 miles the battery will be dead. This only happens when the Motolights are on. So I suspect that perhaps they are too much for this little bike's alt capacity (got to do some research to say for sure). I plan to run some experiments, including 35W per side MR16s that came with the Motolights. If less draw is the answer, we can leave the 35W MR16s in or go for LEDs. • Using this bulb in enclosed fixtures will elevate operating temperatures and may shorten the life of the bulb. Less draw is the answer. My wife had a 2003 F650CS with 35w Motolights. She could run the lights or run the high beams but not both simultaneously. Thanks Eric - good info. Re heat all lamps' lives to my knowledge are reduced by higher heat produced by enclosed fixtures. LEDs surely produce less heat than standard MR16s, though. And thehy have much longer lifespan to begin with, to boot. My guess is if fitment isn't an issue, these would last a very long time. As to the heat issue: they obviously run cooler than an incandescent bulb in an enclosed fixture so I was not overly concerned but not an ideal environment for either bulb type. We'll see how long they last. And yes, I believe these are identical to the Motolight LED bulb but at a lower cost. The LEDs will run cooler, but they NEED to run cooler if you want them to last. I'd think a good, well thermally managed, enviromentally sealed LED would likely last forever and be a very good choice lamp for conspicuousy. I can't vouch for the accuracy, but poking around just a bit, it looks like the CS should put out 400 Watts. I've got 50W motolights on my 11RS, and I have to say that, while it works fine, they are hard on the system. especially mid winter, with the electric jacket, etc... I wouldn't use the 50W bulb on the CS. As I understand it (and I know I'm not telling you anything new), the problem is that the alternator doesn't put out the same wattage at idle as it does at, say, 3000rpm. Sitting at a light at idle, it's really easy to use too many of your elecrons. High power LED's run exceptionally hot. The voltage needs to be controlled accurately - and a resistor to drop the voltage isn't going to cut it. Without dissipating the heat from the LED into the Moto Light's housing - ie. using the housing as a heat sink, the way Clearwater Lights does it, and a specialized controller to manage the voltage, the LED's will likely fail in short order. Relative to a halogen bulb, LEDs are very cool and needs to be that cool or they will fail. LED junction temps any higher than 150 degrees C will result in fast end of life. This may sound hot, but relative to a 1100C filiment, it is very cool. Getting the heat out of a high power LED is a major issue. Motolight housings seem to get rid of 50W of heat and get to a temp that is likely a bit higher than you can feel comfortable touching. That's around 40-50C providing you wasn't riding in the desert. The LED, if disipating 5-6W, IMHO may have a chance at of working. A high power LED can be powered by with a dropping resistor. Although, the power disipated in the resistor will kill the LED efficiency and need as much heat sink as the LED itself. Controllers provide the proper current without disipating much power. The best LED controllers will control current (not voltage). The LED voltage is very temperature sensitive, so current regulation is best (I designed and built a high efficiency LED controller into a headlamp back in 2002). The controller is another silicon based device that cannot get hot or it will fail. So there again is a thermal management challenge for the design. Bottom line, it likely is very possible to put LED lamps into a Motolight housing. But the risks are high. My 35W bulbs have lasted since '07. So, for me, I cannot see the need to add risk to a design that already works. Ed - I agree with the last sentiment, except it may be that even a pair of 35W will be too much for the F650's meager power output to handle. So we're going to try the LED, and see how it goes. Sorry Moshe, I re-read your original post and the LED solution seems to me to be a great solution. I tried to edit my last post, but edit time expired. I pondered through a bunch of MR-16 LED bulbs out there and they all look a bit different. Some don't look like they will fit. Others suggested on this thread, the aluminum ones, look as like they will bring the heat to housing best. I will. If the LED heatsinks make contact with the Motolight housing, I can add some heatsink paste we use at work, which helps transfer heat directly from source to sink. Will let you guys know. Moshe - from what I remember about replacing the bulbs I believe they will but only on the back side. The front is protected by the gasket. If it can dissipate heat from a 35-50w halogen bulb it should have no trouble with 4 watts. Having a Datel mounted on the dash I could easily determine the power draw difference between the two bulbs. If anyone is at all concerned try contacting Motolights and see what they say as they are suppling a kit with the LED lights. So far, to quote the illustrious Borat, "Great Success!" Before LEDs, I tried standard 35W MR16. 35W per side helped the problem, but did not solve it. With high beams and heated grips on, the battery would run down in about 40-45 minutes, about twice what it lasted on 50W per side. Brother, these things are BRIGHT! At least as the 50W Motolights were (Luminous Flux rating is 330) and a total draw of 12W total. The heat sink is substantial and I didn't bother with any special goop. Rode for an hour with high beams and heated grips on full - no problem. Tomorrow, a full day's ride to test things out. And we'll see if they last 20,000 (!!) hours as the spec sheet lists for avg lifetime. Brother, these things are BRIGHT! At least as the 50W Motolights were (Luminous Flux rating is 330) and a total draw of 12W total. Looks like a nice choice bulb for the motorlights. A single 6W LED will be seriously blinding to look at. Many datasheets for those LEDS have warnings. Although, 330 is almost half the lumen output of a 50W MR-16. Looking at the LED, your eyes see luminous intensity (or candlepower), not luminous flux. Since the LED is nearly a point source of light, it appears far brighter. This is why the LED in a motolight is great for conspicuousy. If the LED had exactly the same beam pattern as the 50W bulb, the illuminance (how well the objects ahead of you are lit up) will show the 50W brighter. But not much brighter, since half brightness isn't much. Great report. I'm tempted to go the LED route when my 35W bulbs die. 8am-7pm ride today to upstate NY (Cold Spring through Bear Mtn. and back) - no problems whatsoever. So, this was a solution that worked. Thanks for all your advice! Sounds good, but, IMO, if your battery was drawing down that much with that little extra load, something isn't right. What did your dealer say since you are still under warranty? I can run both Gerbings jacket liners, twopairs heated gloves, heated seat, 50 W Motlights, electric accs. (GPS/XM/Autocom) w/out any issues. But, I can add the PIAA's (1100's) and heated grips too w/out issues. 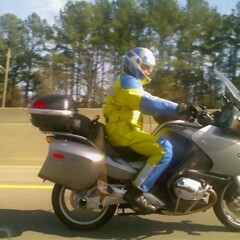 I think your bike should handle you, Jacket/gloves, Motolight, heated seat/grips w/no problem. Someone else can do the math, but I'm curious if anyone else has you problem. to stick with the original GT. This whole issue revolves around my friend's 2005 F650CS, which puts out 400W max, not my 2009 RT. The RT handles it all with room to spare. Moshe, any updates on longevity of the LED MR16's? They've been fine since installation. In theory they should outlast halogens. The LEDs typical for Motolights are gnerally about 200 lumens, though you might find some a bit more. But the reflector design doesn't get it for light down the road which is presumably what someone who put a pair of 50W lamps on a little bike wants. The LED swap will work for conspicuity but if you want light down the road, go to a different lamp that uses 10W LED(s) and had a suitable lens design. A pair of Solstice SP120 without harness, etc is about $200- about 900 lumens each. No Motolites - whether halogen or LED - are much good at putting light down the road. They performed near the bottom in the last MCN test in that regard. They ARE good for conspicuity, primarily due to placement. They are also well made, and they look cool. The truth is the RT (especially the Hexhead+ years) has EXCELLENT stock lighting and doesn't really need much help in that regard. My current setup is pretty insane, following an MCN test. I now have upgraded bulbs all around, Glendas under my oil cooler, Motolights, and Kristas under my mirrors. With the Kristas on I can signal Mars from NJ. Yes, in theory. However, they're also mainly designed to sit inside an climate controlled room and not move all their lives. A bike is a different environment, obviously. We shall see how they fare, but it's not really an issue. They should definitely last years and given the cost of replacement which is dropping every minute, it's not a big deal. If they are made by Cree the minimum life will be over 50,000 hours. Maximum is unknown and only an educated guess utilizing software. Vibration and cold are of no issue but heat is. There's an old saying I like: "The difference between theory and practice is much greater in practice than in theory." Know what I mean? Assuming a sensible design that doesn't overheat the LED(s)- not always correct because there are quite a few with inadequate heat sinks- the life of the lamp would be limited by sandblasting of its lens- which may or may not be available as a spare part depending on maker and age when needed. I've killed some low mounted lamps (eg a pair of PIAA 1100s back in the 90s) this way in about a year and most of the time don't have a set long enough to be an issue. For halogens, its not unusual for the reflector to get poor enough to warrant a replacement after a few seasons but most LEDs are pure lens designs with no reflector to go bad. That 50,000 hours is pretty much an irrelevant number- among other things it forgets that LEDs require voltage and / or current control bits made from ordinary low grade parts, whose potential failure is what actually limits many LED lights. Failure of these add on circuits is pretty common. Moshe, I know what you mean about the RT- the real reason for adding more lights, unless you ride out in the country at night like I often do, is the triangle effect for which MotoLights are fine- they've got a rugged housing as you know. I don't like too many LEDs on mine due the rather obnoxious glare of their point light sources compared to halogens or even HID- and use only a single pair of !0W under the cooler. But unlike HIDs they're OK for frequent dimmer use so I suppose I could substitute them for my FF50 driving lights- though I don't need more reach or output than those. Am in process of farkling a K1200GT I bought a few weeks ago and will need to decide what to do with its lighting which is the reverse of the RT (GT has 1 lo and 2 hi bulbs in its housing, the RT is the reverse). I don't believe we will be actually experiencing these incredibly high life-time span high numbers. Rather, it will be the same as with household CFL lights: we were promised that these would last forever, too, but I replace them at home more often than my remaining halogen lamps. The tubes do not fail, the electronics do. This is to be expected, of course; market (that is, us) demands the cost of the light source - fluorescent or LED - together with a complex drive circuit to be close to what it replaces: a piece of wire. So, the driver circuits are cheap and the results are in. It is unrealistic to expect (and disingenuous for manufacturers to advertise) CFL or LED lamp lifetimes so many orders of magnitude higher that filament-based lamps. Still, hopefully these should last somewhat longer than incandescents. To me the main advantage of LEDs is their low power draw and the point-source characteristics, useful for conspicuity lighting. That is why I am thinking about installing LEDs into Motolights. My setup on the RT is similar to what was described by others above: Motolights always on, for visibility. Bike's own headlight (with built-in fogs always on) for low beam. High beam assisted by a set of small PIAA driving lights under nose. Hi and low beams converted to HID: even though pattern is screwed up, the glare seems to be not bad. A few comments on the comments. "That 50,000 hours is pretty much an irrelevant number- among other things it forgets that LEDs require voltage and / or current control bits made from ordinary low grade parts, whose potential failure is what actually limits many LED lights. Failure of these add on circuits is pretty common." "I don't believe we will be actually experiencing these incredibly high life-time span high numbers. Rather, it will be the same as with household CFL lights: we were promised that these would last forever, too, but I replace them at home more often than my remaining halogen lamps"
The 50,000 hours may not be relevant to some but it is to the industry. Without the long life and less energy consumption there would be little to market by the manufacturer. It is a very big deal with respect to maintenance and replacement costs. Tossing that aside, reputable manufacturers do not utilize "low grade" parts in their products. Cree, Samsung, Philips, and others use very high quality parts in their LED products. If the product fails to deliver at the higher cost it is a problem. With respect to the CFL we were never promised they would last forever. All manufacturers print the information in their catalogs. Go to Sylvania, GE, Philips and look at their data. The CFL was designed for 6,000 to 10,000 hours to replace the A19 incandescent with a 750 +/- hour life and consumes 25% of the energy cost. I am not a fan of the CFL but for other reasons, not life cycle. As stated in H7 headlamp debate, all are not created equal. as there are H7 lamps rated 120 hours, there are also H7 lamps rated 1100 hours. It is your choice. Please do not judge the CFL or LED based on a Wallyworld $5.00 purchase using "cheap" parts. Racer 7, Cree is located in Durham. If you ever ride there check out a McDonalds, it is 99% LED. If at night take note of the parking lots around the city. If the lighting is uniform, no dark spots, no hot spots, no glare, chances are it is LED. Not that it matters but I have researched, purchased, tested, LED technology for the last 5 years, from Cree, Lithonia, Hubbell, Cooper, Samsung and Philips. We purchase the products at full retail, test them in the real world, collect the data with pretty accurate meters, both light and power. It is part of what we do, we are not affiliated with any manufacturer. In July of 2013 we will open a new school with 99% LED technology in classrooms, restrooms, public areas, parking lots, building exterior. It will consume less than 50% the electricity costs of the same prototype opened last year. Our power bill is over 4 million a year, energy means something to us as well as maintenance and replacement costs. I will let you know how it turns out and you are invited to tour it if ever in the area. A Ural is a great bike, but not a BMW. Chinese LED chips can be good, but in the big boy class. All H7 lamps are not created equal. I am NOT recommending any product over the other nor any technology over the other nor what should be utilized in the lighting on our rides. In fact, I do not even have HID's in my headlamps so what do I know. Just saying apples to apples. But if you were to put in HID set up, what would you use? FWIW, I recently installed 35W/6,000K HID lights to replace the low beams on my 09 RT, and the 55 W amber halogens in the Motolights on my bike. It's the best lighting setup I've found so far. Actually, I don't see the need to do anything different now. I believe I saw you at lunch in Dublin. Are you coming Saturday to Montezuma? I will PM you my thoughts on the HID situation. I am NOT against any HID installations nor do I have an opinion on the legal aspects, just an opinion on the products. Give me some time, I am at work, well I need to go back to work. I have a pair of fog lights on my F650. They came w/ 55w and years ago I changed them to 35w Halogens for the same reason you mentioned. I also run my heated grips and sometimes a heated liner. One item I installed was a voltmeter to let me know what was going on with the charging system. I found the 35W were fine, but not with my heated liner too. About a month ago I installed LED's in the fog lights and can easily run the fog lights, high beam AND heated liner and grips and the voltage is fine. No issues at all. I use a lot of LED in my work, and it is amazing what they will do with 1/10-1/15th of the wattage compared to a halogen, not to mention the long life of the "bulb". Yes. This is exactly my experience with Matt's bike as well.